We Manufacture Semi Automatic Alluminium Tube Filling Machine with first fold and second fold and for adhesives M fold is also given , the operator places the tube by hand to the rotary turret , tube is filled , and it goes to first fold, then second fold after that to batch coding station and then to the ejection station only tube is loaded manually all other aspects are taken care by the machine. With tube filling machine you can fill cosmetics, ointments, creams, tooth paste or Petrolium Jelly. (Single Hopper Single Nozzle) Aluminum Tube Filling, Machine. Tube Diameter max. 50mm, & Tube height max. 220mm. Positive suction & displacement complete SS-316. After each filling session a control on tailing is achieved by a pneumatic cut-off system, along with filters, that cleans the nozzle of the excess sample. (5 Gms. to 30 Gms.) or (30 Gms.to 100 Gms.) or (100 Gms. to 250 Gms.) Any one of the three sets will be provided against requested specification in your order. 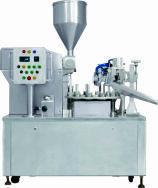 Machine is suitable for 5 gms to 250 gms with inter changeable Syringe pump. Hopper of 45 Kg capacity (Working Volume 40 Kg). Cam for Valve operation as well Fine Tuning adjustable Control System. Activate Sensor with Electrical Logic Control system. Up to 35 Tubes/ Min. In Single Hopper Two Nozzle (depending on the Fill sizes). Automatic Filled Tube ejection at separate station. (b) Filling, filled Tube Ejector Automatically. Overload clutch for centering and micro switch cut-off system. Necessary functional features like emergency stop, re-set, inching, and user friendly, Electrical logic system are standard with the machine, with interlock & indication on the main operator’s of panel to Electrical logic Control. 1. HP; 1440 RPM 3Ph. 440V AC. Hindustan /Rami Make. Suitable Gear Box Ratio 30-1 Make PREMEUM/P.G. Drive with Separate Drive. (L) 1450mm x (W) 940mm x (H) 2050mm. Overall Wt. Approx. 525 Kgs.